King Of Beasts Slipped And Fell In The Water In An Embarrassing Incident Caught On Camera. Lion is known to be the King of Beasts - across most cultures of the world. This is mostly because of a lion’s appearance and partly because of the social structure of a pride and the lion’s role in the pride. This king of the jungle, head of the pride and ferocious animal able to strike fear into the heart of any man. But this king loses his pride after falling in the pond. 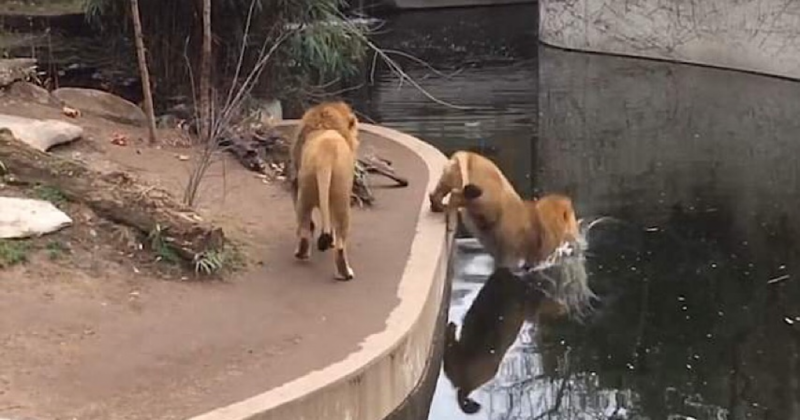 These two lion buddies are taking a stroll through their home at the zoo and while they’re a little too close to the edge of the water, neither seem to mind. It’s as if they’re both engaged in a riveting conversation about the fabulous chunk of meat they ate for dinner or what time the cubs need to be put to bed. The fierce and gorgeous lion to the right takes one little misstep and immediately he went down. The poor lion’s head first go down into the water, making a big splash and freaking out his partner on the solid ground. The grounded lion looks on, completely bewildered and unsure what to do as the wet lion lifts his head and “kitty” paddles around the perimeter of the pool to shallow water. Seems like he’s not thrilled, but knows exactly what to do! Poor big kitty! At least he got a proper washing and recovered well!